December is here, and with it has come over a foot of snow in my part of the world. Can boreal birds be far behind? They better not be! How do you embrace the extremes of December? What are you doing that this weekend and will birding be involved? Share your plans in the comments below! I had shoulder surgery (torn labrum) this week and am unlikely with only one good arm to go ogle avians. Heck, I can hardly type! Corey will be kicking around Queens unless a better offer comes along. Wow! 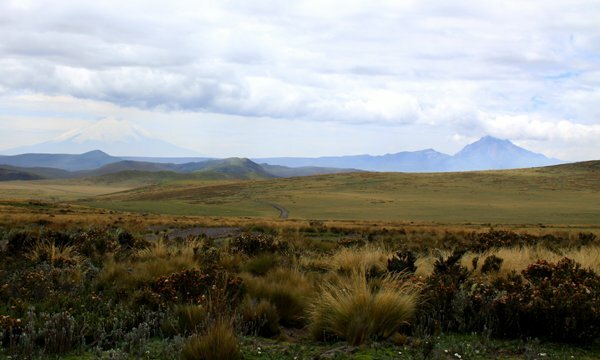 Check out the roiling skies above the paramo at Antisana Ecological Reserve in Ecuador. Good luck with boreal birds. I will be looking for cloud forest species while guiding around Monteverde, Costa Rica. I’ll be doing the Tongariro Crossing in Tongariro national park in central North Island on Saturday. On Sunday I’ll be looking for Blue Ducks in alpine streams in and around that same park before driving to Napier. On Monday I’ll be looking at the Australasian Gannet colonies at Cape Kidnappers. Makes me want go hiking! questo luogo trasmette pace e serenità. Out of the Cuyahoga River onto Lake Erie off the shores of Cleveland Ohio. Looking for gulls and whatever other kind of waterfowl can be found. where are yourself and Corey birding in the first week of 2011? I should be on my way to JFK around then. Sadly, Redgannet, I will be in sunny southern California. But if you find yourself out there between Christmas and something like 6 January let me know! I am traveling to an exotic birding location I have heard talked about online…Queens! I’ll be visiting family in Forest Hills and my dad wants to go birding in Jamaica Bay. Weather permitting (big “if” right now) we’ll be there or in Flushing Meadows park Sunday morning. It’s so beautiful. This is one of my favourite landscape photos. Those mountains at a far distance, reminds me of a land far far away.